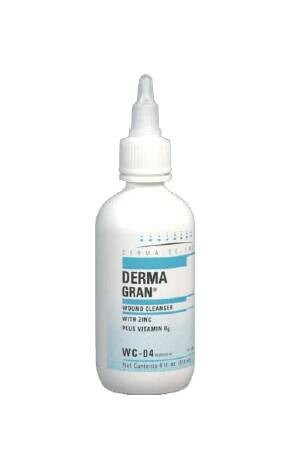 Dermagran is a Wound Cleanser that contains Zinc and Vitamin B6. These two nutrients have been found helpful in wound healing. Dermagran Wound Cleanser is a gentle skin and wound cleanser. Dermagran Wound Cleanser prepares the wound bed to become an optimal environment for wound healing. Manufactured by Derma Sciences, Dermagran Wound Cleanser contains one of the lowest cytoxic solutions. The spray bottle container for Dermagran Wound Cleanser, uses a protective cap that does not require to be fully removed in order to spray the cleansing formulation. This easy to use spray bottle meets the AHCPR guidelines for irrigation pressure. Derma Sciences Dermagran Wound Cleanser is designed to complement Dermagran B Dressings. By using the Derma Sciences Dermagran Wound Cleanser with Dermagran B Dressings, caregivers can optimize clinical outcomes for wound healing. 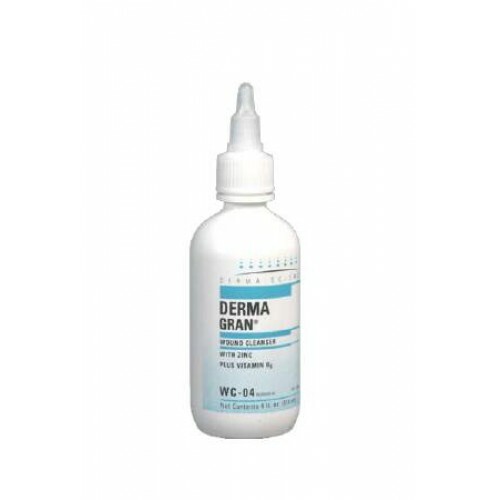 Dermagran is formulated to cleanse and irrigate dermal lesions such as lacerations, post surgical wounds and ulcers. Zinc and Vitamin B6 enriched. Gentle skin and wound cleanser. Meets the AHCPR guidelines for irrigation pressure. Derma Sciences Dermagran Wound Cleanser Product Number: WC04. Impregnated Ingredients: Zinc and Vitamin B6. Timothy B., Hellewell, BS, David A. Major, BS, Pamela A. Foresman, BA, George T. Rodeheaver, PhD. Cytotoxicity Evaluation of Antimicrobial and Non-Microbial Wound, WOUNDS: A Compendium of Clinical Research and Practice. Volume 9, Number 1, January / February 1997. Dermagran Wound Cleanser, a gentle cleanser. Dermagran Wound Cleanser provides a gentle stream of solution to irrigate wounds and promote healing. Enriched with zinc, Dermagran helps heal faster.